Christmas Day turned out to be a huge boost to the mobile device market, according to two analytics firms, as iOS and Android devices saw over 17 million combined activations while Apple's iOS App Store enjoyed a 70 percent boost in revenue boost as downloads increased 87 percent. On Thursday, mobile app analytics firm Flurry reported (via Venture Beat) that more than 17.4 million iOS and Android devices were activated on Christmas Day, a 332 percent increase over the December baseline average of 4 million activations per day. The number is more than 2.5 times larger than Christmas 2011, the previous one-day activation record holder which itself tripled that year's baseline. 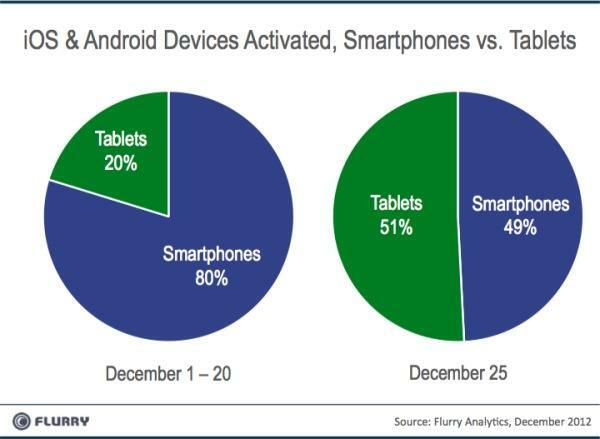 Digging deeper into the data, Flurry found that smartphones accounted for the bulk of activations leading up to Dec. 25 with a four-to-one ratio, but tablets took the lead on Christmas Day and netted 51 percent of all activations. The firm noted that Amazon's Kindle Fire HD saw the highest single-day growth, skyrocketing several thousand percent compared to the December baseline. App downloads were consequently affected by the mass increase of newly-activated devices, with Flurry charting a 112 percent increase in downloads on Christmas compared to the previous 20 days. Overall, a reported 328 million iOS and Android apps were downloaded. Building on Flurry's numbers, analytics firm Distimo broke down app downloads by platform and found those from Apple's App Store to have increased 87 percent on Christmas Day compared to the December 2012 average. While not as substantial an increase as Christmas 2011's single-day performance that tripled the baseline, this year's jump resulted in a 70 percent increase in revenue. As for device growth, app download data suggests that the iPad was a popular gift as downloads and revenues rose 140 percent and 83 percent, respectively. The firm also tracked the most downloaded non-Apple apps, with Google's YouTube and Maps topping the list, followed by perennial favorites like Skype and Instagram.